Any tone of dark color cabinets will definitely be compelling to Cambria Windermere Dark Cabinets Backsplash ideas. Your backsplash colors are neutral in kitchen remodeling. This article will guide you about the name and the characteristics of the backsplash, the color and glaze of the dark cabinets with my favorite picks. If you would like to dig more information, please look at my Sandy Beach: Cambria Windermere Countertop article. The material of the backsplash for Cambria Windermere Dark Cabinets Backsplash Ideas can be ceramic, travertine or limestone, tumbled marble and glass. The type of the backsplash tile can be subway and 4×4 Square. The set up of the backsplash can be picked as diagonal or herringbone or brick style. The liners and connections are a very good embellishment in any kind of selection of backsplash as like as Cambria Windermere White Cabinets Backsplash Ideas. The selected pictures of Cambria Windermere Dark Cabinets Backsplash Ideas are ready for your review. 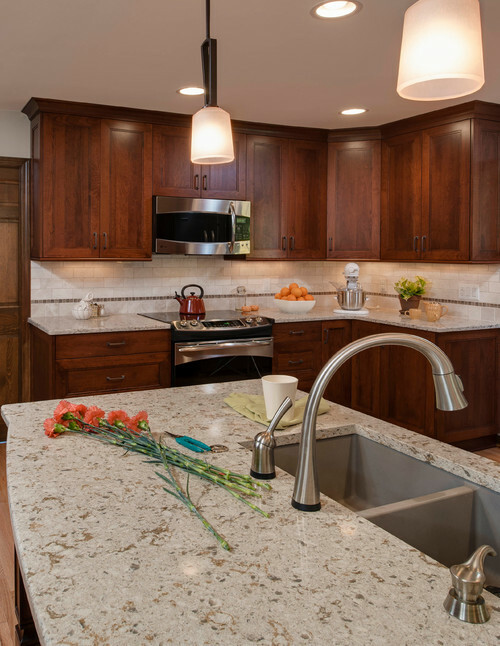 Picture Credit: Sterling Kitchen and Bath., Cambria Windermere is a very good choice for small kitchen remodeling. Cherry wood cinnamon spiced glass door cabinets, neutral pine hardwood flooring and travertine backsplash are the supportive fellows for Cambria Windermere Countertop. The recess lights, under the cabinets lights set up to bring good enough sparkle to the kitchen. Functional and targeted design. Picture Credit:Complete Kitchen and Bath Design., Three tone brick style glass subway tiles and cherry with caramel glazed cabinets and stainless steel appliances make Cambria Windermere more attractive. Over hang island top is cut in trapezoid shape by giving a modern looking to the kitchen. Travertine flooring is a good match. Fresh feeling busy kitchen. Picture Credit:Caledon Tile Bath & Kitchen Centre., You may complain about the cabinets colors. True, they are not dark enough but oak cabinets totally infuse into Cambria Windermere Countertop and ceramic tiles. The Tile is called Rocky Mountain Desert. It is a 4×4 ceramic tile with a set of 4 insert/decor pieces to match. Diagonal backsplash connections have a natural touch.Very chic looking happy kitchen. Picture Credit:Philbin Construction & Remodeling., Brookheaven Cabinetery with arched custom made wooden vent hood, eternal Limestones backsplash tile with the Crema Europa color and Cambria Windermere quartz countertop and quartz island top. Backsplash would not be shown in better way without herringbone set up tiles. Picture Credit: Epiphany Kitchens,. Blossom stained Cherry cabinets with Cambria Windermere Countertop and Island top. The tumbled marble backsplash is from Sonoma Tiles and it is known as Pearl. Tasty and catchy kitchen. If you have any question about Cambria Windermere Dark Cabinets Backsplash Ideas, please do not hesitate to drop a comment. Thank you for your collaboration.